I've been blogging since Jan, 2011, but got more serious about it the summer of 2012. My favorite part of book blogging is meeting other bloggers with whom I can discuss books! *and swoon over hot book boyfriends! * I thought my TBR was out of control before I started blogging...it has grown tenfold because of all the great books I learn about through other bloggers! Oh, and I've met some great authors that I might not have met otherwise. It's all just goody-goodness! I think I've grown as a reader and, hopefully, a reviewer. And it's largely due to having met all my blogging friends! 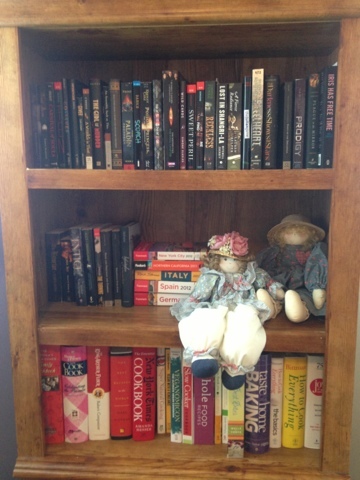 Q: Bookshelf Tour. Give us a tour of your bookshelf. I reorganized my bookshelf a few weeks ago and posted photos up on my blog. Lucky me - I don't have to take new pictures! 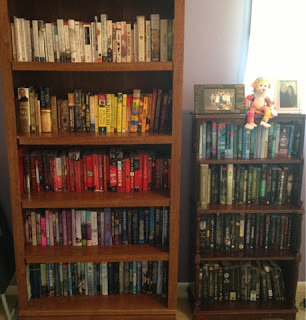 I decided to organize my books by color. It wasn't as much work as I thought it would be and it looks gorgeous. It is a bit hard to find particular books, but instead of taking me 10 seconds to find, it takes me 30 seconds. So it's not that bad. It is up to you to do a Kickstarter campaign for your favorite book!!! Who are you casting for the main characters? I love that you have a "special" book shelf. it's awesome! And I love your shelves, color coded is pretty and worth a few extra seconds to find! The color coding thing sounds like a great idea. Will take that into consideration when I finally get around to organizing my shelves. At the moment, my books are a little disorganized. I could never do the color coding with my shelves... it would drive me crazy. But it looks good on your shelves. Your shelves are awesome! I love the pictures, dolls, and knickknacks. It gives it such a personal appearance. I love the color coding, it's very pretty! Your shelves look great. I really need to get mine organized again. Color coding does seem like it would be hard to find things, but it looks great. Oh very awesome! Love the color coding concept, but my OCD-ness would never allow me to do such a thing. But love seeing it with others! Haha!! Great colour co-ordination!! I love your shelves! 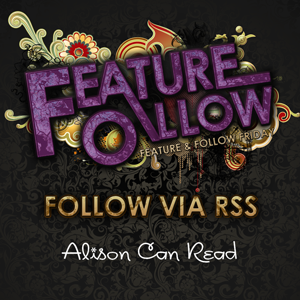 This is my first time doing "Feature and Follow Friday." Really appreciate this, bring a new blogger and all. My blog is only a few months old. Hopping through! Well I never thought of that. Might just try it. Love it. I love the bookshelves! This is my first time participating in Feature and Follow. I think if I organized by color it would take me hours to find anything. It does look good though! Hello! New participant here! You know color coding actually something I need to try because while I have a scatter head when it comes to titles, I remember the covers of the books very well. I recently moved so my books are still in boxes except my "special" books which is a selected list of my most favorite books. Thanks for hosting! I love the color idea! That would look pretty awesome with a bookshelf that spans and entire wall ;-) it probably would be difficult to find a book though unless you really remembered covers! Impressive collection! 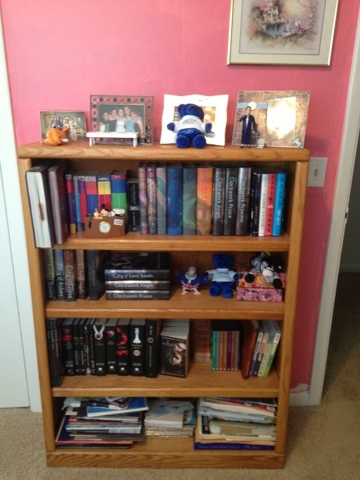 I miss my books :( Most are on my Kindle now. Happy Friday! I do love your shelves - thought I could never do that. I think it would drive me too crazy looking for certain books - even if it was only 30 seconds. I love your special bookshelf, too. Very cute! Hey Alison! Happy Friday :) You have some lovely shelves there. :) Have a great weekend! My first FFF! I love the color coding. It is beautiful. I've thought about doing colored shelves, but I have OCD so bad I know I won't be able to do it. They would all be mixed up :( But they look so pretty!! Sigh! SO MANY SHELVES. And the rainbow is SO COOL! This week, I didn’t do a feature. I am doin this project and it would mean a lot of you commented on THAT instead... And follow via email too! Wow - those shelves look great color organized! I've seen people organizing them like that before, but I could never bring myself to do it as I would probably have to end up separating some series (which I don't think I would be able to stand doing). Great prompt! Color coded! Love how it looks! Also, I just noticed you started with white and transitioned to yellow instead of starting with red. Did that take a lot of hemming & hawing on your part or was it a natural inclination? My bookshelves are also by color. Love yours! thanks for stopping by my FF, Ali. Beautiful! I want to do a color thing with mine, but I just can't make myself separate books in the same series. I'm just OCD like that. Thanks for coming to my FF! I must admit arranging books by color does look beautiful. But my inner OCD, just wont allow me to do it haha.